We’ll be selling bottled water, clif bars, and eggs for visitors today! What is unique about your coop stop? Bruce named it the “Coop de Ville” in the and we haven’t changed the name. In order to get it to fit on our very sloped property (40% slope? ), we had to add some new lumber to accommodate the slope and also to put in a door that we could actually walk through. It’s probably 90-95% reclaimed. We modified the storage area on the right to be another nesting area. I also used 4″ PVC to create a gravity feeder (not pictured) that can hold about 15 pounds of feed. We started with 8 hens were hatched in March 2016. We bought them from the Ace Rural Supply Hardware store in downtown Los Gatos for $3.99 each (they sell them each year, first Thursday after Valentine’s day and on until around Easter). They’re a bit over 2 years old and are laying well (we get maybe 4 to 6 eggs a day from the 7 hens). We have 4 nesting box areas in the coop that are made of recycled wood wine boxes. The girls tend to like to lay in certain boxes: one of them is really never used for laying. I think they sleep in it though! Our tractor was gifted to us by a “Silicon Valley Chickens” member in the Cambrian area of San Jose. One of our girls was stung in the face by a yellow jacket and we needed to isolate her. When we got the tractor home, my husband Scott attempted to take off the old chicken wire. He had wanted to replace it with more secure 1/2″ hardware cloth as we live close to an open space area with an abundance of wildlife. When he want to remove the chicken wire, the entire thing fell apart. We also found it was ravaged by termite damage. Hence began yet another restoration! We replaced about 50% of the wood with scraps of wood we had laying about and used a birch colored peel and stick vinyl flooring in the covered area. 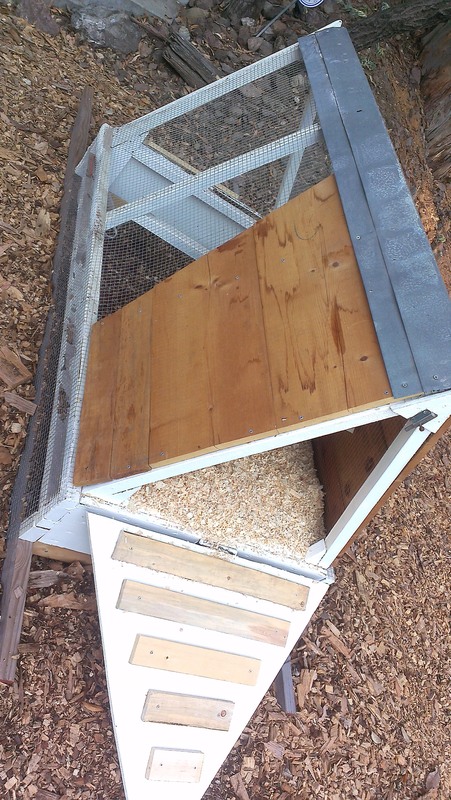 I used scraps of pine to create horizontal tractor bars so that the girls don’t slide down the ramp. 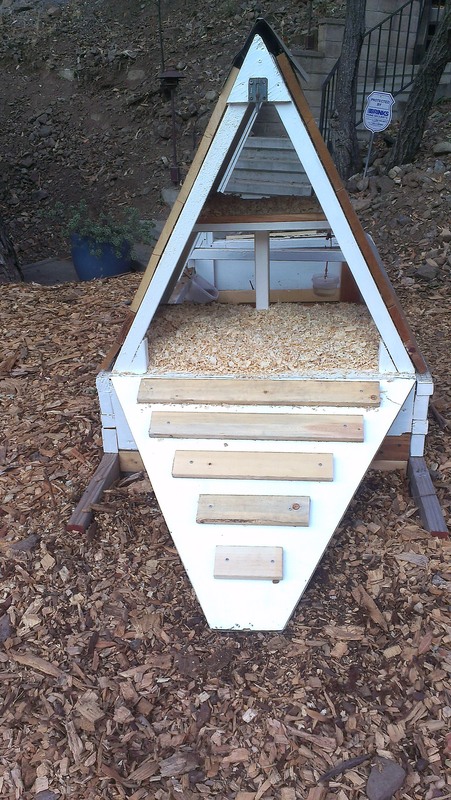 If Ikea made chicken tractors, we think it would look like this. What are the names of your chickens? Leftover food from the house (organic, no onions/citrus/avocados). They love spring clover and miner’s lettuce. Do you ever let the chickens out to free range? Yes, but only in the winter and spring when there are green weeds on the slopes. They love to scratch and will really do damage to the slope in the drier months. They are also only out when we can supervise them. We have lots of predators in our area (bobcats, mountain lions, owls/falcons, raccoons, coyotes, and dogs off leash). Have you done the Tour de Coop before? Yes! This is our 3rd year. How much time does it take to raise hens (time commitment)? We don’t always gather eggs every day. We’ve left them for 2 or 3 days without issue. (5 minutes when we do). The default is 4 per lot in Los Gatos. But if you get a CUP (conditional use permit), you can have more. Rules vary by town/city/county, so check with your local town officials. Can you have a rooster in Los Gatos? Yes, if it’s quiet and doesn’t violate the noise ordinance. You should also ask your neighbors if they mind.